T P M S M T D N o v e m b e r 2 0 1 8 96 • Tires and wheels are installed that are not equipped with a tire pressure sensor. • A type of film that affects radio waves has been affixed to the windows. • Snow tires or tire chains are used. • e sensor battery has been depleted. • Wheels other than manufacturer fac- tory wheels are being used. If wheels other than those specified are used, the system may not function properly because of interruptions in transmissions from the tire pressure sensor. Depending on the tire type, the system may not function properly even though the specified wheels are used. • e compact spare tire is installed. e compact spare does include a tire pressure sensor and transmitter. • If the system was initialized with pres- sures which were not at the specified values. NOTE: The system will need to be initialized when tires are replaced with tires of different pressures, or the tire pressure sensor and/or tire pressure monitor ECU are replaced. When a tire pressure sensor and/or tire pressure monitor ECU are replaced, the sensor ID must be memorized (registered) by the tire pressure monitor ECU prior to system initialization. See "Reset procedures." TIRE PRESSURE MONITOR WARNING LIGHT NOTE: e tire pressure warning light may turn on due to natural causes such as natural air leaks or tire pressure changes caused by temperature. In this case, adjusting the tire pressure will turn off the warning light. NOTE: If the warning light turned on due to very low outside temperatures that cause decreases in tire pressure (such as in winter), adjust pressure to a higher pressure suitable to cold conditions. Tire pressure decreases by about 1.45 psi (10 kPa) for every 18 degrees Fahrenheit (10 degrees Celsius) drop in ambient temperature. NOTE: e compact spare tire is not equipped with the tire pressure warning valve and transmitter. If a tire goes flat, the warning light will not turn off when the flat tire is replaced with the spare. When the standard tire is repaired, inflated to the specified level and returned to the vehicle, the warning light will go out. When the tire pressure warning light does not go off, or when it comes on during driving, check tire pressure and adjust as necessary. e warning light should turn off within a few minutes. If the warning light is still on even though the tire pres- sure is correctly adjusted, the tire could be punctured. Repair as necessary. If the warning light turns on within several hours after adjusting the tire pressure, the tire may have a slow air leak. Repair as necessary. If the warning light is on or blinks aer all above situations have been investigated, there is a malfunction in the TPMS. See the appropriate manufacturer service information. 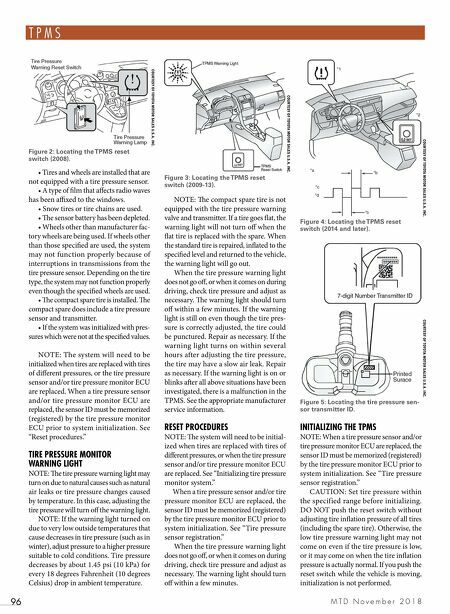 RESET PROCEDURES NOTE: e system will need to be initial- ized when tires are replaced with tires of different pressures, or when the tire pressure sensor and/or tire pressure monitor ECU are replaced. See "Initializing tire pressure monitor system." When a tire pressure sensor and/or tire pressure monitor ECU are replaced, the sensor ID must be memorized (registered) by the tire pressure monitor ECU prior to system initialization. See "Tire pressure sensor registration." When the tire pressure warning light does not go off, or when it comes on during driving, check tire pressure and adjust as necessary. e warning light should turn off within a few minutes. 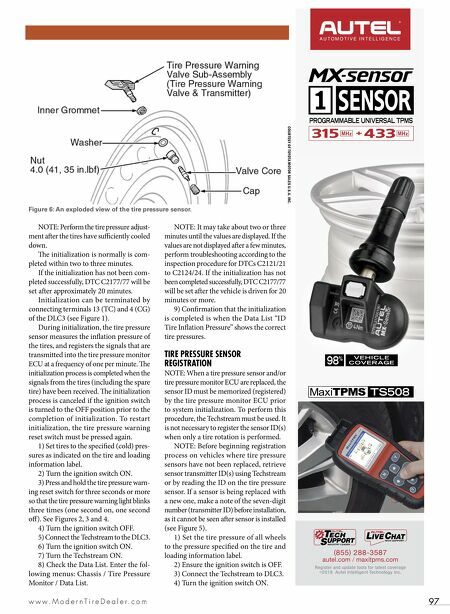 INITIALIZING THE TPMS NOTE: When a tire pressure sensor and/or tire pressure monitor ECU are replaced, the sensor ID must be memorized (registered) by the tire pressure monitor ECU prior to system initialization. See "Tire pressure sensor registration." CAUTION: Set tire pressure within the specified range before initializing. DO NOT push the reset switch without adjusting tire inflation pressure of all tires (including the spare tire). Otherwise, the low tire pressure warning light may not come on even if the tire pressure is low, or it may come on when the tire inflation pressure is actually normal. If you push the reset switch while the vehicle is moving, initialization is not performed. Figure 2: Locating the TPMS reset switch (2008). COURTESY OF TOYOTA MOTOR SALES U.S.A. INC. Figure 3: Locating the TPMS reset switch (2009-13). COURTESY OF TOYOTA MOTOR SALES U.S.A. INC. Figure 4: Locating the TPMS reset switch (2014 and later). COURTESY OF TOYOTA MOTOR SALES U.S.A. INC. Figure 5: Locating the tire pressure sen- sor transmitter ID. COURTESY OF TOYOTA MOTOR SALES U.S.A. INC.